One example of why I'm so slow lately bashing out my splenetic, frenetic 'toons is the one below, which was originally intended to appear yesterday (Monday). That regretful waste of otherwise useful RNA sitting in the White House enrages me so thoroughly that I'm almost incapable of anything but the lowest form of ad hominem attacks, and all I want to do all day is chunk handfuls of my feces at his misshapen pie hole. Be that as it may, just consider the 'toon below a bonus, however minimal. As you might imagine I've been anxiously following the latest investigations into Trump's Russian connection, especially the hilarious Nunes edition, like a starving dog pursues the scent of blood. Almost every second of my day is spent scanning the 'net, waiting for that final "AH-HA!" moment where Trump's perfidy is revealed to the world with perfect clarity. I can't wait to see him manacled by the local constabulary, muttering to himself about how he'd have gotten away with it if not for those pesky kids. Trump: Cool! Is this a scale model of the wall that Mexico is going to pay for? 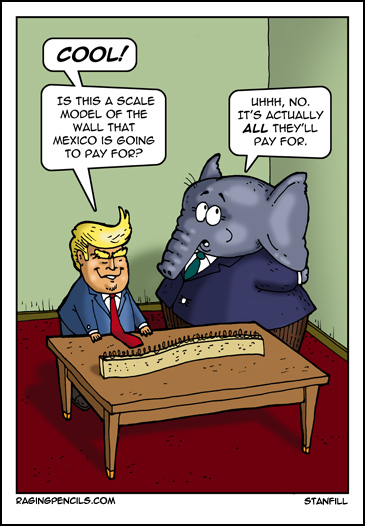 GOP elephant: Uhhh, no. It's actually ALL they'll pay for.